Falling into a contented Christmas Eve sleep after spending several cozy days nestled in the best common room armchairs, toasting marshmallows and English muffins in the Gryffindor fireplace, and learning the wondrous and confusing art of Wizarding chess from his best friend Ron, Harry did not expect the beautiful, mismatched little pile of presents that greeted him at the foot of his bed the following morning. "I think I know who that one's from," said Ron, turning a bit pink and pointing to a very lumpy parcel. "My mom. I told her you didn't expect any presents and – oh, no," he groaned, "she's made you a Weasley sweater." After about 13 years give or take, I recently re-read the first Harry Potter book, Harry Potter and the Sorcerer's Stone, in preparation for one of our "Fiction Kitchen Podcast" episodes (you can listen to the episode here) and rediscovered all of the wonderful in-text foods J. K. Rowling included, and in many cases created, for the series. I am convinced that at least a small percentage of the books' and movies' success was because of the food ;). 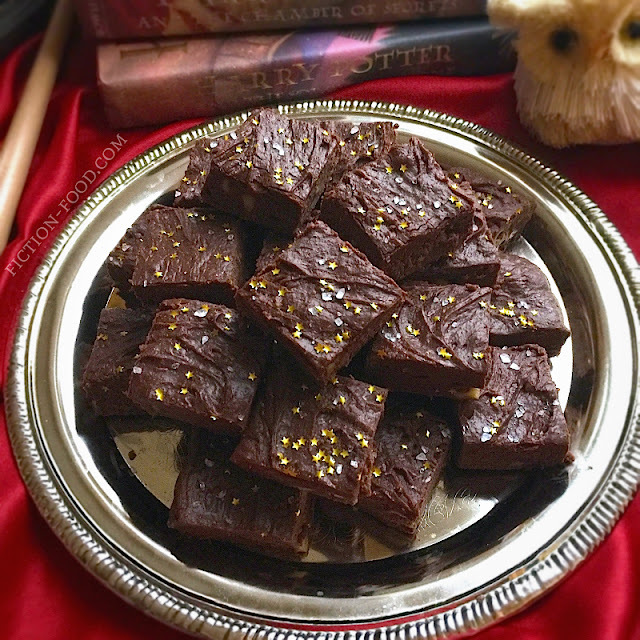 * Check out my Mrs. Weasley Homemade Toffee, too! Mrs, Weasley smiled down at them. "Very," said Harry. "Thanks for the fudge and the sweater, Mrs. Weasley." "Oh, it was nothing, dear." Note: This recipe is similar (and appropriately so!) to Kraft's old "Fantasy Fudge" recipe that utilizes marshmallow créme or fluff. If you don't have marshmallow créme you can use mini marshmallows, as noted below. Also, if you're not into nuts you can omit them, but I put them in because they seemed to match the idea of the Weasleys ;). Line your baking pan with foil, letting the excess hang over the sides, & spray it with non-stick spray. In a med-large bowl put the marshmallow créme (or minis), chocolate chips, & nuts. Set aside until needed (no need to stir just yet). In a medium pot over medium low heat, bring the evaporated milk & sugar to a simmer & cook until it reaches 234ºF on the candy thermometer. Remove from heat & pour the sugar mixture into the bowl of marshmallow, chocolate, & nuts. Add the vanilla & stir until the mixture is fully incorporated (marshmallows & chocolate completely melted). 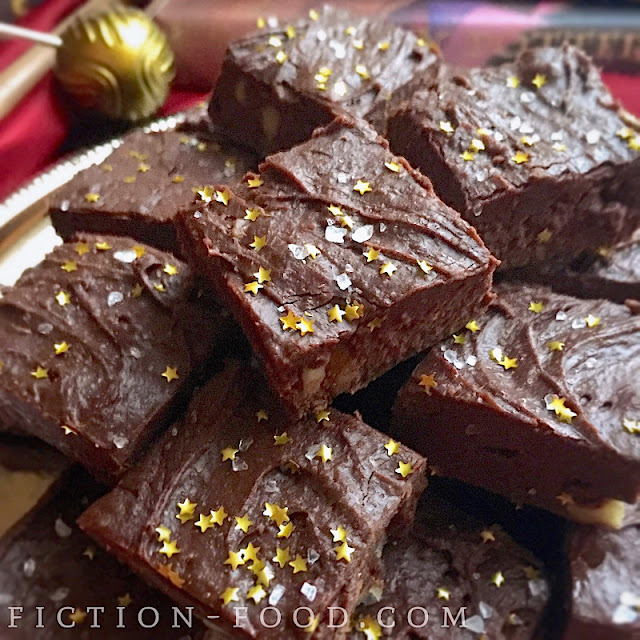 Pour the fudge mixture into the foil-lined pan, spreading it out evenly, & sprinkle the top with a little bit of sea salt & edible glitter stars (this is the magic part!). 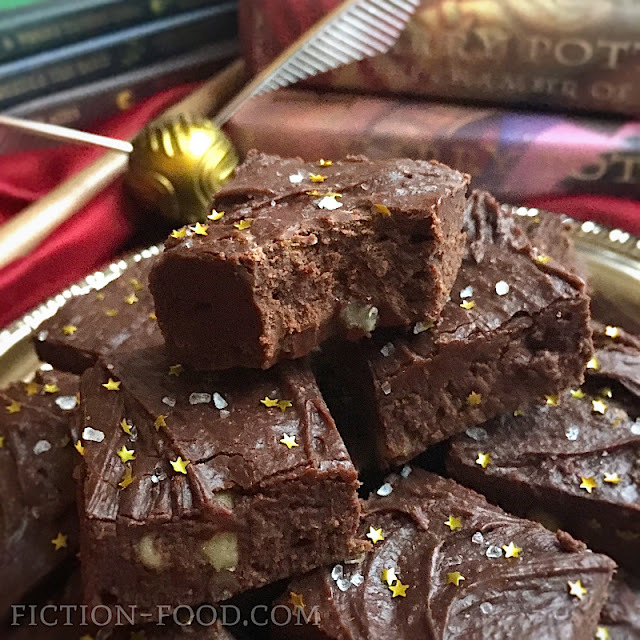 Let the fudge cool on the counter to room temperature & then place it in the fridge for at least 30 minutes. Remove the solidified fudge from the fridge by lifting up on the overhanging foil & place it on a cutting board. Spray a long knife with non-stick & then slice the fudge into pieces about 1 1/4" square or 1 1/2" x 3/4" strips. Arrange stacked on a serving dish, or place the pieces in wax paper-lined gift boxes, or use cupcake wrappers for individual pieces. just made this! the batter tasted amazing and the smell was so good, my sister agrees ;) I'm excited to have a taste when it's finished. 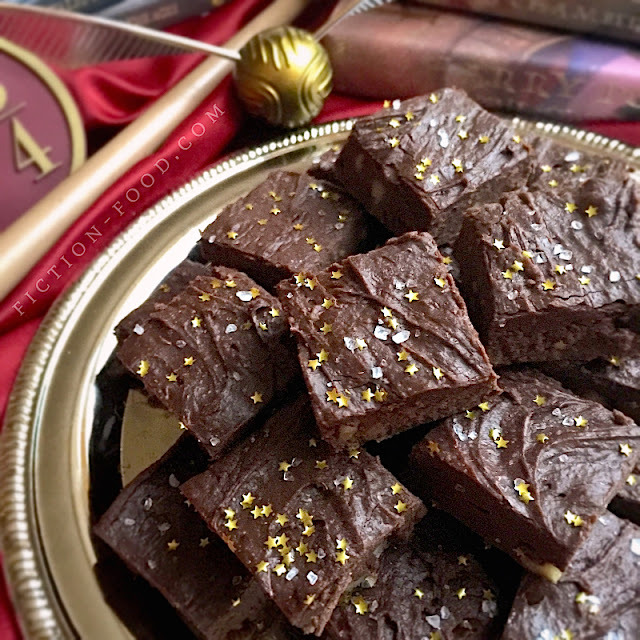 Looks yummy, I love the addition of the gold stars!